The British Forces will hit Company of Heroes 2's multiplayer scene on September 3, but if you want to try out the standalone multiplayer expansion before then, there's a free trial period running from August 31 to September 2 on Steam. Relic says that "up to 55,000" players will get the chance to marshal the Brits' 15 units and new commanders in live combat across the eight new maps. 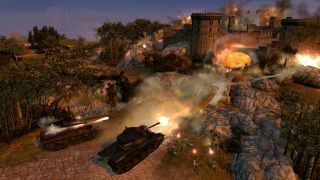 CoH2 chooses to interpret the tactical choices available to British commanders as a "hammer and anvil" system which shifts the weight of your upgrades to favour mobile troops or emplacements and artillery respectively. Perhaps most importantly, commandos will return, and they still plough suicidally onto the map in a big shonky glider. That's a nice callback to Company of Heroes 1, but there will be plenty of new units, accessed through build trees and commander upgrades. The expansion will cost $12.99 / £9.99. Here are a few shots showing new units and a map featuring a large, intricate castle to fight in.